Two DNA binding guanine-specific antibiotics, chromomycin A3 (CMA) and the closely related mithramycin (MM), were used as chromosome fluorescent dyes. Root-tip metaphase chromosomes of three plant species and human metaphase chromosomes were sequentially stained with CMA or MM and the DNA binding AT-specific fluorochrome 4′-6-diamidino-2-phenylindole (DAPI). In some cases a non-fluorescent counterstain was used as contrasting agent: methyl green in conjunction with CMA, and actinomycin D (AMD) in combination with DAPI. — In all three plant species, Vicia faba, Scilla siberica, and Ornithogalum caudatum, the nucleolus organiser regions and/or associated heterochromatin displayed very bright fluorescence with CMA and MM and, in general, heterochromatic segments (C-bands) which were bright with CMA and MM were pale with DAPI whereas segments which were dim with CMA and MM displayed very bright fluorescence with DAPI. 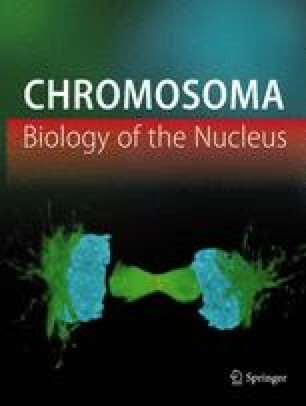 — Human metaphase chromosomes showed a small longitudinal differentiation in CMA fluorescence, which was essentially the reverse of the banding pattern obtained with AMD/DAPI double-staining, but of lower contrast. The CMA-banding pattern appears to be similar to the pattern found by R-banding procedures.